High on the list of things I need to write up is my radar-building saga; suffice for now to say that I’m (now) using a tiny yttrium iron garnet in a magnetic field as my viola to generate the signal for my frequency modulated continuous wave radar. As fancy as it sounds, a Stellex YIG oscillator unit (mounted yttrium garnet, heater, tune and modulation coils) can be found on ebay for around $20. I got a Stellex 6755 job that does 8-10 ghz. In short, all one needs to do is apply heater voltage to the thing to get it generating rf, and adjust the frequency by changing the current in the two tuning coils. It puts out +16 dBm, respectable. A TTL oscillator is cleaned up and complemented by two schmitt trigger inverters a la 74HC14. 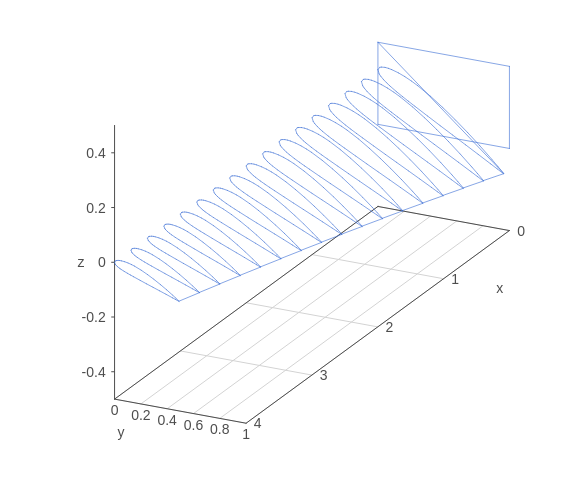 On the rising edge, a 74LS191 4-bit counter latches its incremented value, and on the falling edge, the DAC samples the value and produces the specified current. 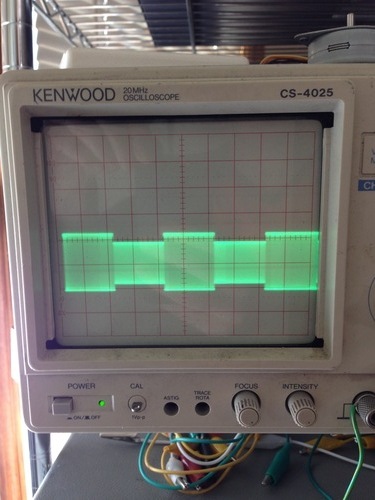 Eventually I'll replace the counter with an FPGA so I can do arbitrary waveforms (hint, a triangle wave lets you deduce both range distance and doppler shift at the same time in an FM CW radar), but for now the modulator is at least aesthetically pleasing. While the DAC in fact outputs its value in the form of current, not voltage, the current range (max 10mA) is far below what is needed to tune and modulate the YIG (around 250 mA). Alas. Thus, we use the resistor network specified in the DAC’s datasheet to convert our current source (hopefully very linearly) into a voltage signal with which we will… drive a power op-amp setup to convert voltage signals to current. One of my new favorite parts I happened to find in my ICs bin is the L272, a dual op-amp beast that can source or sink 1A continuously. Rather than using a (regular old) op amp to drive the gate of a mosfet or BJT as is common, this beast of an op amp means we can drive the tuning coil(s) of the YIG directly. Unfortunatly, the huge current capability comes at a cost: the L272 has a slew rate of 1 V/uS and a unity gain bandwidth of 350 kHz, far below what would be required to follow my above modulator signal with the 5 MHz clock on it. Drat. This limits the sweep rate and thus TX bandwidth of the radar considerably, but at least doesn’t suffer the oscillation problems with transistor-driver circuits that limit max slew rate and bandwidth there, too. In any event, we use a 10 ohm resistor on the negative side of the tuning coil to generate a voltage signal (hopefully very) linearly related to the current drawn,and use the op amp to compare this voltage with the “requested” voltage, adjusting its voltage output until the current monitor’s voltage matches. and ready to cut some sweet parts. I'll do a long post about the jet projects in progress, here's a sneak preview. 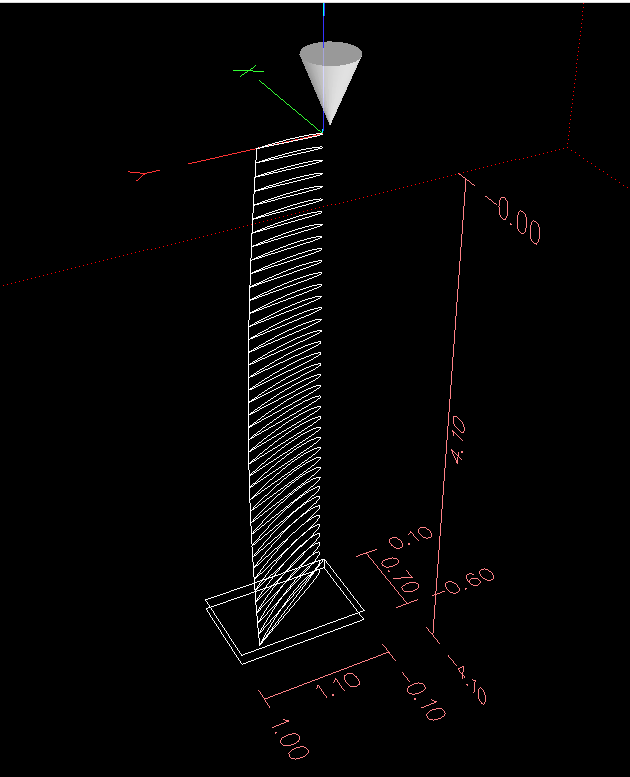 In about a page of Common Lisp, I nab the XY values for a NACA 2408 airfoil, scale it progressively from root to tip, twist it 25 degrees, and generate G-code to cut it using either the 4th axis or vertically top-down (or detecting that your blade profile can't be milled top-down). Oh, and also serve up an HTTP interface to view the shape updates in real time using visjs. I revisited my super awesome Quartus install and Makefile post a few days ago in an attempt to replicate the setup so I can write some sweet verilog, but alas, Something in the package from Altera was different. I tried the latest and greatest Quartus, now from Intel, which installs and works impressively well here on my desktop. But! It no longer works at all the same from the command line, which breaks my workflow. While I was originally planning to write a tiny SNMP daemon for my geiger counter so as to graph trends, I decided instead to write a kernel module exposing the counters. This way, my system can use the interrupt events as a source of true randomness (radioactive decay is, by definition, truly random). First, a quick introduction to the random number generation bits in Linux: drivers/char/random.c. This module in essence keeps track of two things: a seed value, and a pool of entropic data to mix in. At boot, the seed is set to the previous shutdown value (if available), then mixed with device-constant sources of entropy such as MAC addresses, serial numbers, and so forth. While running, drivers such as keyboards, mice, and disk controllers contribute to seed entropy by calling one of the add_*_randomness() functions defined and exported from random.c. These functions keep track of time deltas between calls, mixing the seed value with new values from the entropy pool between reads. The random module presents two char devices for userspace to get data: /dev/random and /dev/urandom. On each read(), an SHA1 hash is taken of the current seed value and returned to the user. This result is then mixed with the seed value itself as well as some data from the entropy pool. The difference between them is this: if the entropy pool becomes depleted after successive reads, /dev/random will block until more entropy data is available to mix in and hash, thus ensuring the output is non-deterministic. However, /dev/urandom will continue returning pseudorandom data even without entropy, simply mixing the seed with the resultant SHA1 hash each time around. Determining the seed value and predicting the output would require an inverse of SHA1 (no small feat), but it is nonetheless mathematically possible to do so given enough resources. As you can see, sources of good entropy are extremely important for reasonably random numbers. While human input sources like the keyboard and mouse are still valid, disk access time data is no longer usable with SSDs due to their highly characterizable behavior. Companies like Intel have implemented hardware randomness and key generation functionality, the closed-source nature of the beast has been cause for skepticism particularly in the post-NSA revelation climate - for instance, OpenSSL still doesn't use the Intel key generation instructions for AES despite significant speed benefits. The point to all of this is that good random seed data is hard to get, and radioactive decay is a great source. Back to the task subject at hand: Radseed listens for hardware interrupts on the ACK line of the parallel port. When such an event is detected, the events counter is incremented and time of last event (in jiffies) recorded. 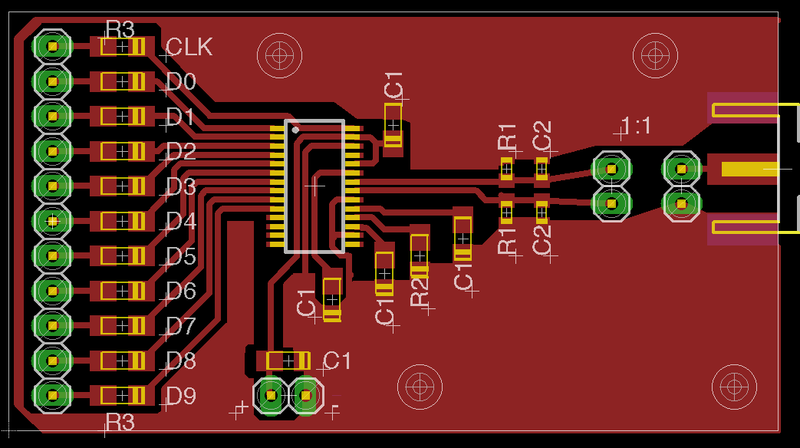 Since very few things even have parallel ports anymore (plus I have a bunch of geiger-muller tubes sitting here), I'm working on a board design for a small USB geiger counter that doesn't need external power and can be plugged into anything for easy external entropy. Code is on GitHub: jackcarrozzo/radseed. I've been considering ideas for audio gear of various sorts over the past few months, and decided a good starting place would be a solid ADC interface from which I could prototype concepts. Lots of companies make audio converters, but I settled on two models from Cirrus Logic: the CS5361 and CS5340. They are, respectively, balanced and unbalanced two-channel 24-bit 192 khz high dynamic range delta-sigma oversampling devices. 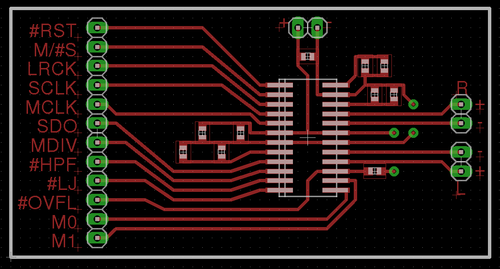 I started by laying out a super-simple protoboard for the CS5361. Since I wanted this to be quick and easy to cut on the CNC mill, the board is single-sided with the bare minimum of filtering, and without standard mixed signal board design concepts like separate analog and digital ground planes. While this will negatively affect the noise figure a bit, I wanted to get the device up and running with the minimum investment of time in case my assumptions regarding its usage and support were incorrect. By the time I had finished the layout and cut the board, the samples order had arrived! 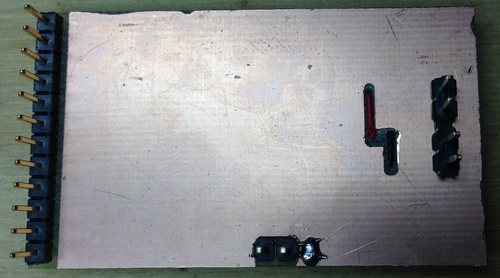 Soldering was quick though a tad arduous - I need to use a larger 1206 footprint next time. With the hardware working, I set about writing the Verilog modules to nab samples from the ADC and send them off via USB (using an FT245R FIFO interface I have on hand). 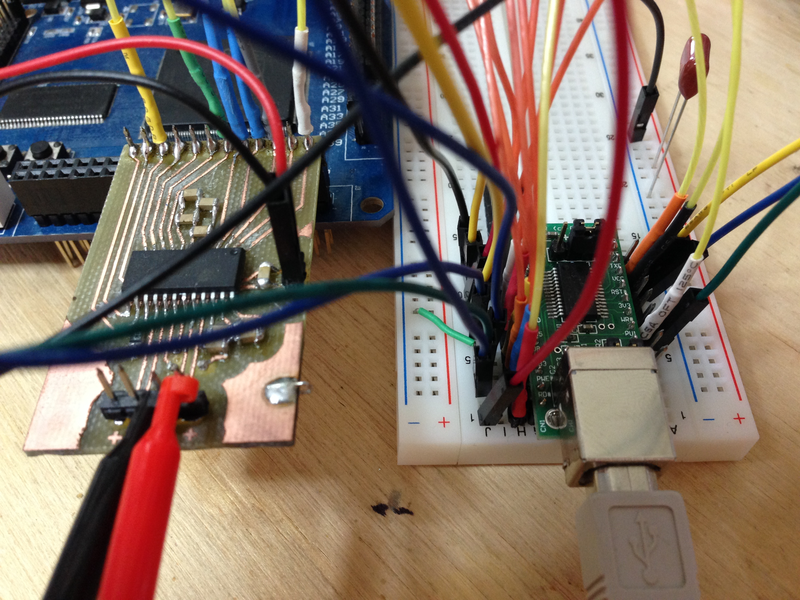 The code is extremely simple: on the rising edge of SCLK, samples are shifted into an 8-bit register - the size of the data bus on the USB interface. 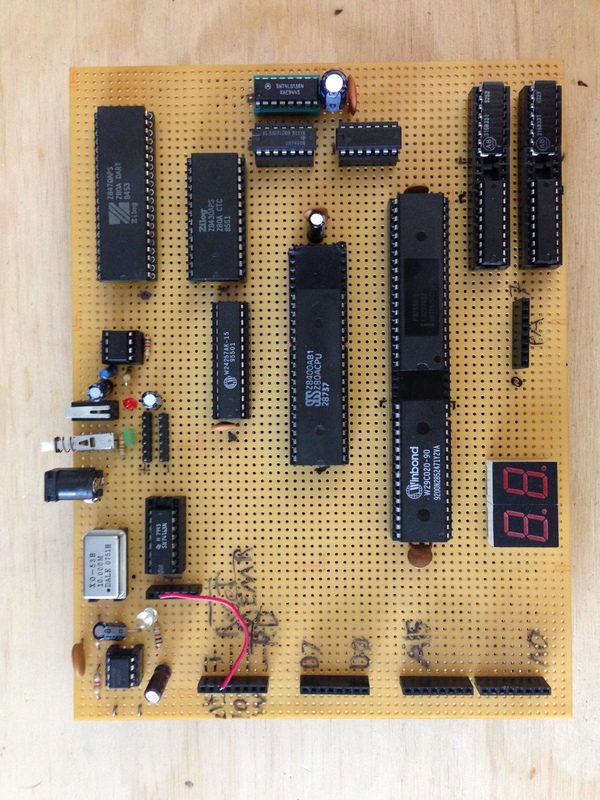 Every 8 bits, that register is strobed into the FT245R and the process repeats. Byte alignment is provided by LRCK: on a start or reset condition from the USB host, the FPGA waits for a rising edge of LRCK before beginning the sampling and transmission of samples. This allows the client end to interpret the data stream without framing bytes: incoming data is simply shifted into 3-byte (24-bit) samples, left then right, and processed as desired. Success! With that working, the next steps are to implement the CS5340 and add proper dynamic configuration loading. From there, I am hoping to implement ADAT input and output and a simple device driver to interface the kernel audio subsystem. I've put the code, board design, and a bit of documentation on GitHub: jackcarrozzo/cs_adcs. I set out recently to run modern (> kernel 3.5.x) linux on a Sun Netra T1 I had laying around, and it turned into to a rather in depth process indeed. I do have a soft spot for Sparc and Sun hardware in general, and have a few of these machines that have been running FreeBSD for ages without issue. However, I was hoping to use this particular machine with a Linux kernel driver I wrote which interfaces my geiger counter, seeding the kernel random number generator with events. OpenBoot 3.10.25 ME, 256 MB memory installed, Serial #14265310. Ethernet address 8:0:20:d9:ab:de, Host ID: 80d9abde. Hmmmm. The machine begins loading the image, but stops at byte 0xa00000 and prints the above. Googling shows that this is a known bug on this hardware (see https://bugs.debian.org/cgi-bin/bugreport.cgi?bug=658588) - apparently the Debian netboot images got too large after Lenny and Netra is no longer supported. Nice! The kernel boots and the installer loads but... another known bug: the SCSI controller isn't located. Sigh. I then tried a few Ubuntu versions, all of which were too large and triggered the MMU miss above. (1) Due to the small size of my disk and the enormous number of files in recent portage, I kept running out of inodes while untarring. I ended up making /usr much larger than it needed to be and asking mkfs for the maximum number of inodes (-i 1024) to solve it. (2) For some reason, the permissions of items in /dev on the install chroot were not to emerge's liking. chmod a+rw /dev/* provided the quick fix (for obvious reasons, don't do that on any real system). Disabling "/dev/openprom Device Support", "openprom /proc Entry", and "OBP Flash Device Support" from the kernel config solved the issue - I didn't bother tracking down exactly which module was the problem as I don't need openprom support, but presumably it could be determined quickly. After rebuilding the kernel and initramfs, it boots successfully! Both 32- and 64- bit binaries can be compiled and run using the -m32 or -m64 flags, respectively, to sparc-unknown-linux-gnu-gcc. Another thing of note is that the machine will hard lock under high load, such as compiling kernels. It just so happens a thread came up on the sparclinux kernel mailinglist about a memory management bug just recently, with a few patches slated to be merged into mainline: see http://marc.info/?t=139934944100001&r=1&w=2. I'll hopefully get around to applying and testing the patches in the near future. EDIT 2015-02-19: This config is for older (<v6) versions of rsyslog; the newer syntax in v8 and above is much cleaner - plus the functionality is improved, including a bunch of awesome modules like ZMQ and Elasticsearch. Check it out: rsyslog.com/doc/master/. This took way more slogging through docs than I expected, so perhaps this note can save someone the trouble. I've used freebsd's syslog daemon to receive remote logs and store them by file for years, but I needed to add a log host at home so that when the cable modem dies, logs still go somewhere. After much reading and messing around, here's a working incantation to keep local logs operating normally, but remote logs writing to hostname-based files. Remember that, if you use %HOSTNAME% as I did above, you should either have relevant entries in /etc/hosts or accept that a nameserver failure may cause logs to end up in ip-named files. Building on the simplicity and success of my DAC board paired with my FPGA dev boards, today I threw together a board with an Altera Cyclone II, two DAC9000Es, an FT245R, and supporting periphery. 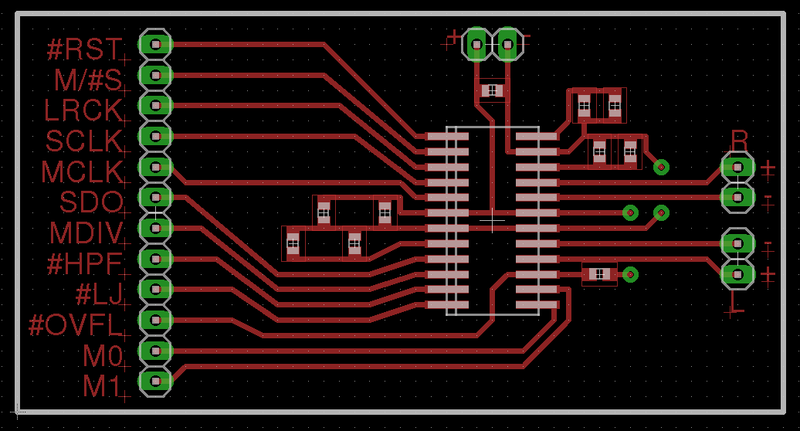 I'll need to check it with fresh eyes tomorrow to ensure I haven't made any mistakes, but with luck I can submit the design tomorrow evening and have the boards next week. My DAC+FPGA pair has proved extremely useful for transmitting test signals of various sorts, taking I+Q via USB and generating the output signal in code. But, at 160 MS/s, its max frequency is quite limited. 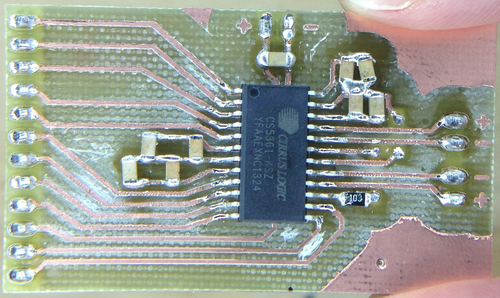 This new board has two of the same DACs, however each will simply generate the I or Q signal alone which will then be combined with an LO in a dedicated QAM modulator chip. This allows for carrier frequencies limited only by the abilities of the QAM modulator chosen, and at 160 MS/s the usable Tx bandwidth will be huge. I've chosen to terminate the DACs in SMA connectors and leave the modulator off the board entirely, as I'd like to evaluate a few different chips. Unfortunately this board will be too large for me to mill at home at the moment, but I can still quickly mill test boards for QAM modulators in about an hour. 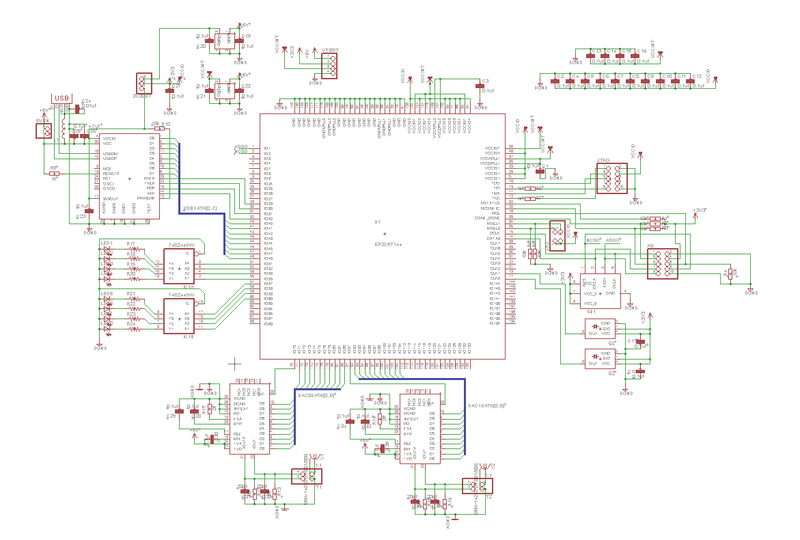 As I've been making steady progress on my Z80 computer, I've put a lot of thought into something to actually do with it when it's done. As tempting as it is to load up CP/M, add a video interface, and use it as my main machine, I think porting Firefox is too ambitious. For now, I've decided to add some more 7-segment displays and an RF front end to decode the WWVB time signal from an atomic clock in Colorado and hang it on the wall. If I'm still feeling ambitious, I'll add an Ethernet controller and write a driver and NTP daemon for it. Of course, this means I need a working receiver front end for 60kHz. The WWVB signal is quite simple as far as decoding goes: the carrier has "full power" and "low power" states. 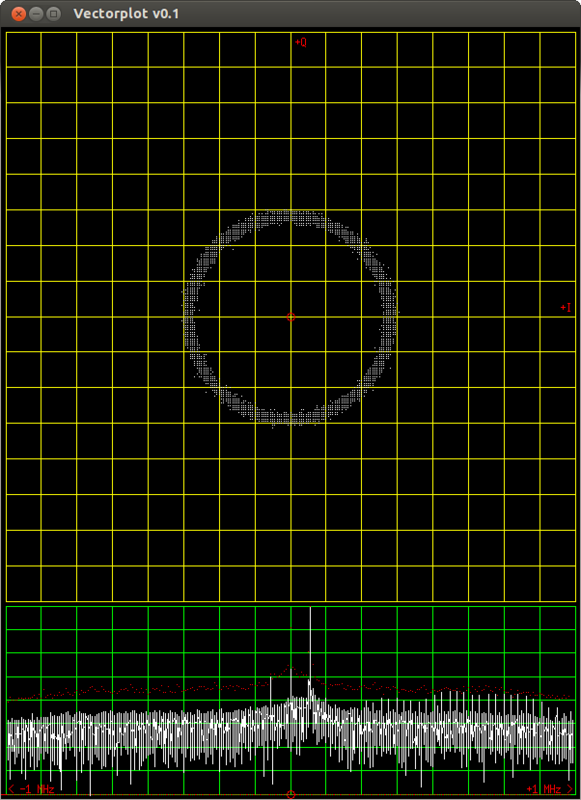 The transmitter drops the carrier by 17 dB at the start of each second, and the length of time before it returns provides a single trinary value: Mark (0.8s), Not Set (0.2s), or Set (0.5s). A single digital line that goes low or high to follow the transmitter power state is quite easy to achieve with a fully analog circuit: after a bandpass to select only the 60kHz carrier, we send the signal into two peak detectors - one with a long time constant (low pass filter) to track the average signal power over several seconds, and one with a shorter time constant to track the per-second changes. Passing these two signals to a comparator, we get our nice single-bit TTL indicator of the current signal state. Plus, the longer time constant peak detector acts as an auto gain control, so no alignment is required. 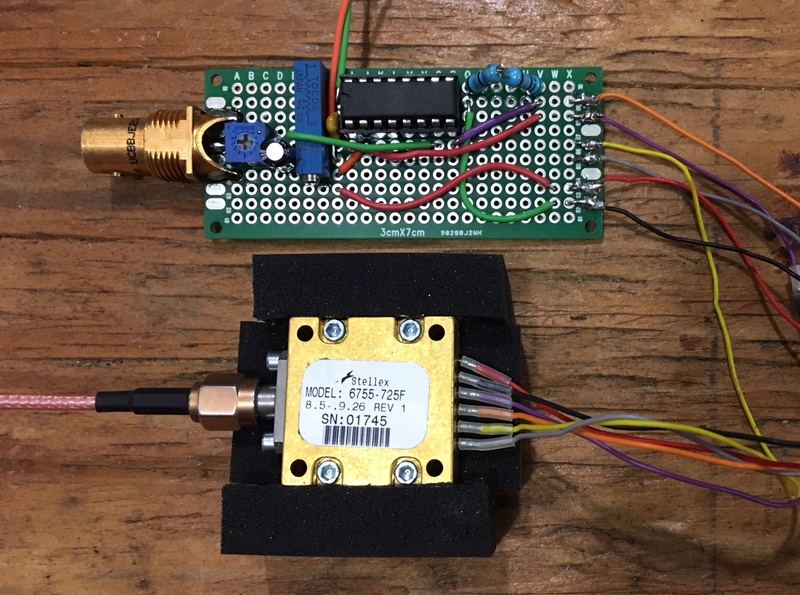 While I will make my own receiver as described above for the final version, I ordered a SYM-RFT module for testing. It includes an LED to indicate received carrier status and outputs the inverted carrier power state compared to the average carrier power. 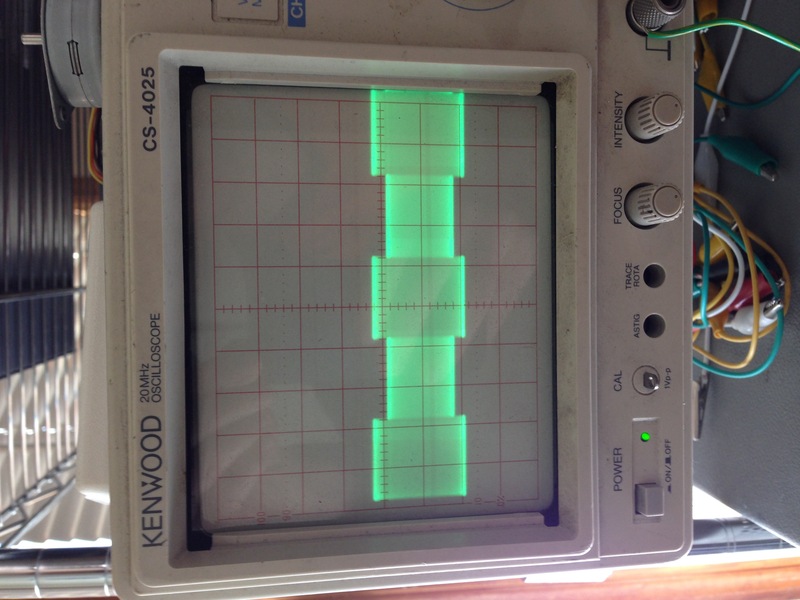 I quickly breadboarded it up to an FT245R USB chip and wrote a few lines of C to poll the power status and measure the length of state changes. Unfortunately, New England being quite far from Colorado, the signal is below the noise floor and has thus far been highly unreliable. The module simply flashes chaotically in the presence of any electronic noise like my monitors, and does nothing in isolation. 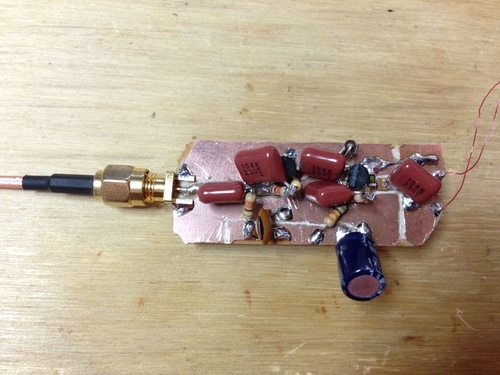 I built the above two-stage preamp from two 2N3904's to attach to the 60kHz antenna that came with the SYM-RFT module to see if I could see any carrier on the oscilloscope. While I did get all sorts of noise and impulses, there was very little if any energy at 60kHz. Drat. After a small battle with PLLs to get a slow enough clock for 60khz, both the SYM-RFT and my USB worked fine. I've rebuilt my previous Z80 computer and have been adding several peripherals of late. I think that ultimatly, after I decide the final design, I'll rebuild the whole thing to look pretty and be better laid out for higher clock speeds, but for now I'm continuing to prototype here. 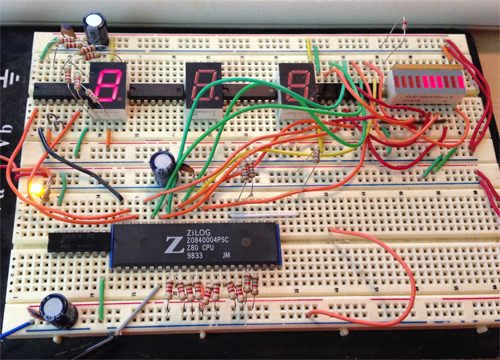 CPU: Z80A - While I have some later devices with more features and faster clocks on hand, I'm testing base functionality with a run-of-the-mill original. Flash: W29C020 - Boot ROM. The device is 256 kB, but I'm only using 32k (memory map is split between RAM and ROM). Technically I could enable write functionality to the flash, but haven't done so thus far as I haven't needed it. SRAM: W24257AK - 32k. Haven't implemented any MMU or paging, but it would be trivial to do so in the future if need be. Address Decoding and Glue: 74LS138, 74LS32, 74LS04 - Some people use PLAs or GALs to do this in a single device, but I have an attachment 7400 series logic. General Purpose IO: 8255A - Provides three 8-bit ports per chip. Right now ports A and B are tied to 7-segment displays via 74LS244 octal buffers. Rather than use 7447 7-segment decoders to save 4 bits, I connected the displays directly so that I can display the A-F characters correctly via a map in ROM. This has been quite helpful while writing the BIOS. Timing: Z8430APS CTC - This guy provides four counter channels with a handy list of prescalers and vectored interrupt features. Right now the BIOS configures channel 0 to send an interrupt every 10ms for polling routines, and channel 1 to provide a compatible baud rate clock to the DART. Async Serial: Z8470APS DART - Contains a whole slew of serial comm features. Currently the BIOS configures channel A for 9600 8N1 and transmits debugging information through it. System Clock: 10MHz Osc + 74LS163 Counter - The 4-bit counter provides clocks at 5, 2.5, 1.25, and 0.625 MHz, selectable via pin header. The 555 in the upper-left corner provides a 10kHz clock signal for visual debugging also, but at this point the BIOS is far too long to sit around waiting for it to boot at that clock speed. Reset Controller: Analog! - At power on, a 1uF capacitor is slowly filled through a 1Mohm resistor to Vcc. When its voltage exceeds that set be a voltage divider (1/2 Vcc here), a comparator (TLC3702) releases the RESET_ assertion. A switch between ground and the capacitor provides another way to trigger a reset. So far so good! Hopefully I don't jinx myself here, but I haven't made a single wiring mistake yet. I have the logic analyzer sitting here ready, but every time I've added a new chip the unit has just booted right up and worked flawlessly - I can't believe it, given the sheer number of connections. By the way, I forked the assembler and fixed a few tiny things. 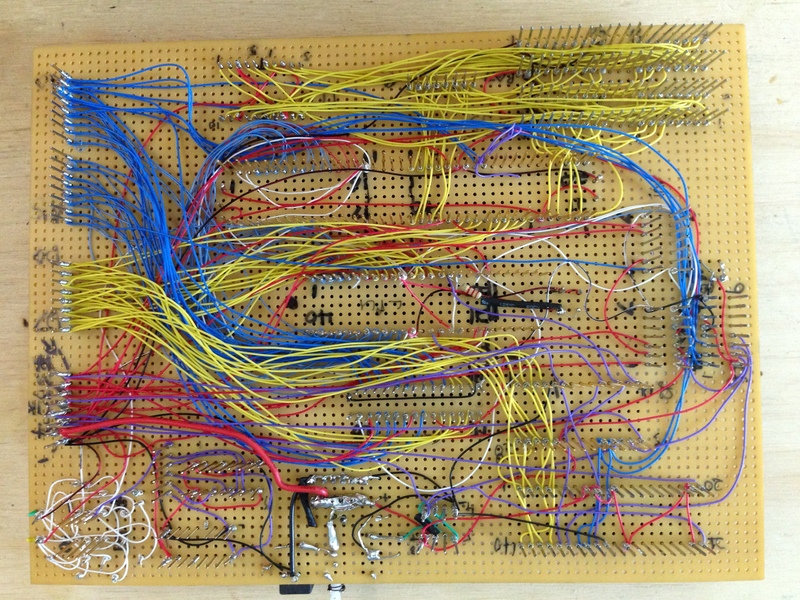 Check it out on GitHub: z80asm. Also, I've spent a good bit of time writing emulations of the 8255, CTC, and DART in C as well as fixing the interrupt handling in my fork of z80sim: see my fork here. 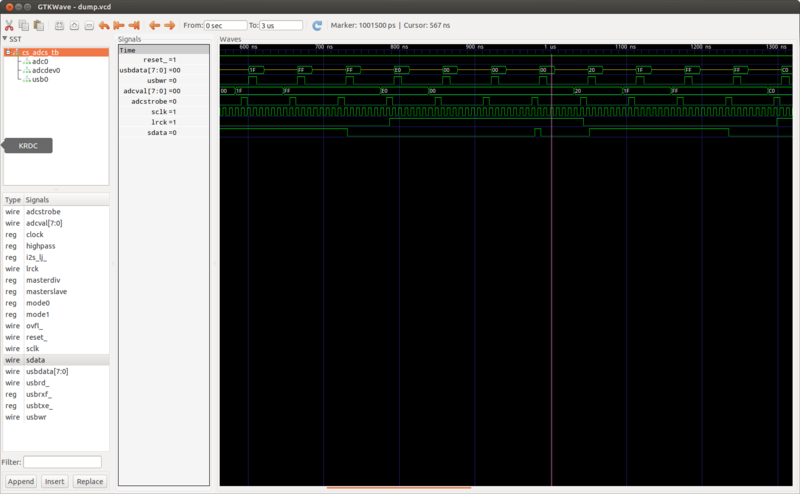 The file containing the my chip emulations is io.c (a work in progress at the time of writing). 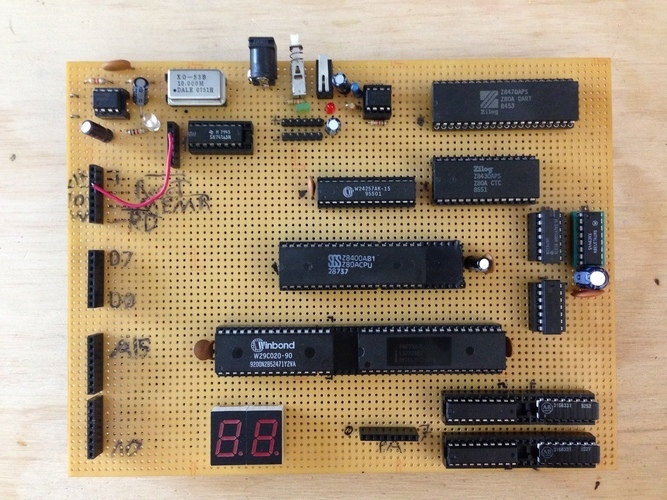 I recently pulled out the Z80 project computer I built several years ago in the hopes of adding some hardware and features to it, but was sad to find that it didn't want to operate in the slightest. A quick connection of the logic analyzer showed that the CPU was not fetching instructions. Hrm. I needed to determine if my delicate, hand-wired little computer was at fault somewhere, or if the CPU itself was upset. 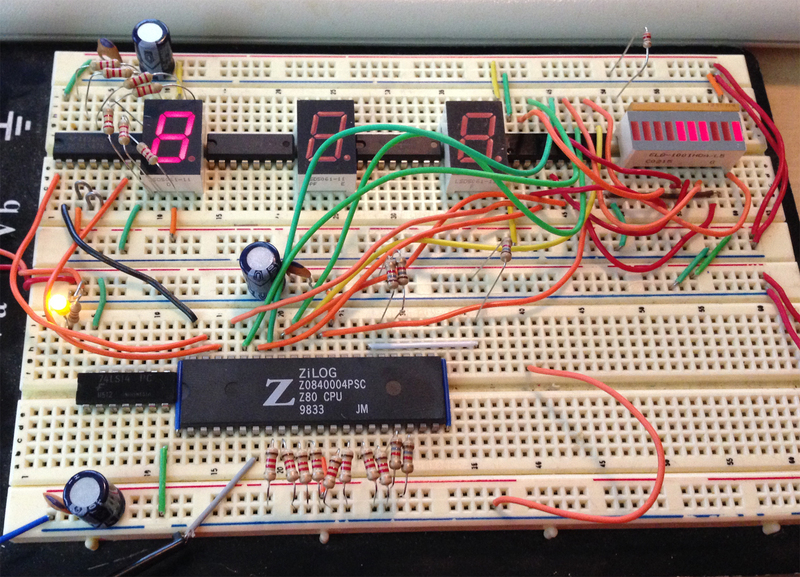 First, I breadboarded the following setup to test the Z80. Since the opcode for the NOP instruction is 0x00, setting the data bus to zeros and providing correct external state causes the chip to simply count up the address bus when clocked. I pulled the data bus to 0s with 1k resistors since the chip is in an undefined state before reset and could attempt to write to the bus - bad news if you're tied to a rail. I then set WAIT_, INT_, NMI_, and BUSREQ_, leaving just a RESET_ and a clock source to add. I really like the simplicity of Z80: not only can I run the chip with only four pullups and no external components, but it will run with clock speeds all the way down to DC. That means you can single step your computer with a debounced push button as your clock - try that on a modern CPU! For this particular exercise, I rigged a 555 timer to generate a 10hz clock - slow enough to watch the address bus with LEDs. At the moment of truth, I got... nothing. 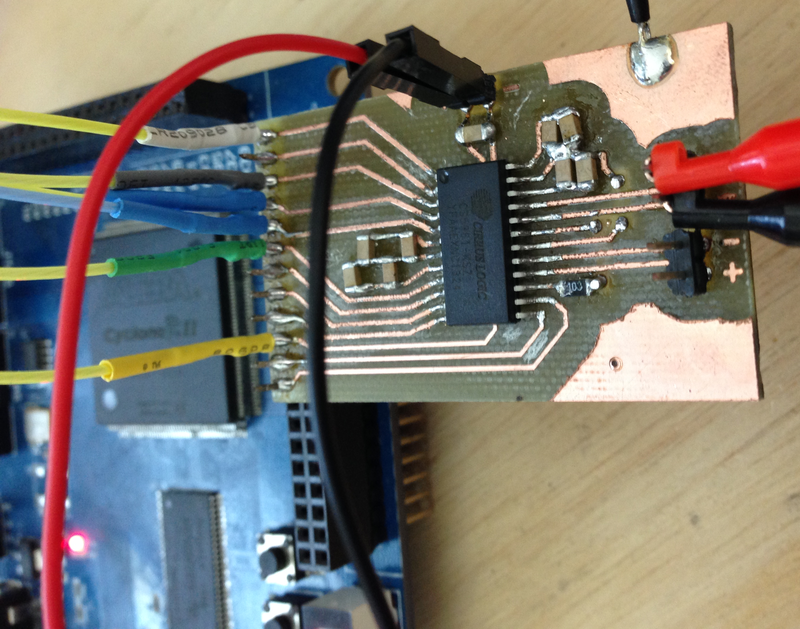 The chip was tri-stating the address bus and not responding to RESET_. Unfortunately this meant I needed to dig deep into the depths to locate my box of Z80 items that I hadn't seen since college. However, not only did I find the box I was looking for quite quickly, I found a downright awesome pile of parts in there! I recalled that I had 3 extra Z80s and two 82C55's, but in reality I owned 16 Z80s of different vintages and speed grades, a few different types of 82C55, and an awesome pile of Z84 family peripheral controllers. I was very pleased. Back at my desk, I tested all 17 CPUs (the one that was in my computer, plus the 16 extra ones I had). It turns out that all of my spares are in perfect working condition, and the one in the computer was in fact dead as a door nail. Good to know! I've been a little unimpressed with the video sharpness from my Canon T3i body since I've had it. I recently determined that, likely due to constant-bitrate encoding, the specific condition causing shots to look muddled is complexity: shots of a cat or a rock may be quite sharp, but moving leaves and ripples on water are apparently too much to describe frame to frame. I had read that the 7d has been used for several high-end movies as well as lots of commercials and shorts, so that was my go-to comparison. I was initially confused however as the T3i and 7d share almost all specs, especially related to video; both use the same APS-C sized sensor, both use 4:2:2 chroma subsampling, and both produce ~45mbit constrained baseline h.264 streams at 1080p and 29.97 fps. The only difference that I've been able to ascertain is that the 7d has two DIGIC 4 processors, whereas the T3i has but one. My only guess is that, with two processors, the 7d is able to spend more time encoding the video stream and as such does a better job of the task. Now that I know the 7d is in fact sharper, I've sold my T3i body and purchased a used 7d. When it arrives, I hope to do some more side-by-side shots to compare settings so as to conclusively determine the best settings for my shots. For what it's worth, the other main difference between the 7d and T3i is the autofocus: the 7d is worlds better. This isn't relevant for video since Canon bodies don't support constant autofocus during video, but for stills I appreciated it immediately. The 7d's high ISO noise may be slightly lower than the T3i but I didn't do an objective, controlled test. Hopefully I will find time to build another axis soon so I can really see how solid both my math and my sensor are. I have a huge list of epic features to add to the project, too. I'm hoping I can get it solid enough to film with a 300mm lens and not need post-process stabilization. I haven't done a whole lot of analog or power supply design, so I thought it'd be an interesting project to build a simple Geiger counter. 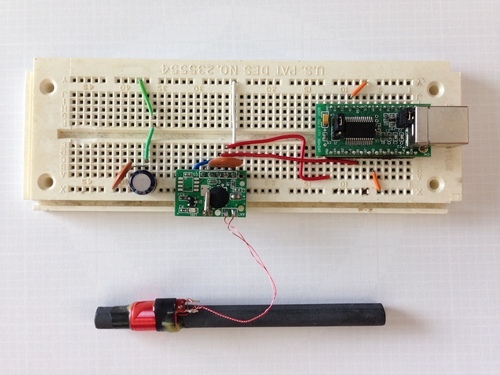 In theory, their operation is very simple: provide ~500 vdc to the tube, and incoming particles will ionize the gas inside long enough to change the impedance of the tube, which we measure with a high-pass filter. To create 500 volts from a 9v input (I'd like it to be portable), I used a 555 timer at 1khz to gate two 2n222 NPN transistors ground-side switching the input to the transformer. I tried a few HV transformers I had in the junk bin, but nothing was quite right, so I ordered a few CTX110607-R's which performed splendidly. From the output of the transformer, we go through two stages of voltage doubler (the last one acting as a rectifier and low pass filter), and voltage regulation is provided by two 200v zeniers and one 100v zenier. The signal is separated from the HV rails by a 50pf capacitor, which then goes to a comparator with one more filter between its two stages. This let me use a fast high-pass and a peak detector, as opposed to a single slow-enough-to-see-and-hear high-pass filter. I recently drew up a board to connect a fast DAC to FPGA dev boards for the purpose of RF generation. I chose the DAC900E from TI as it's fast (165MS/s), pretty accurate (10-bit), and extremely easy to interface (latches values in on clock edges, doesn't require any setup or external stuff). Normally I'd cut a simple one-layer board like this on my CNC mill, but I wanted to try a low cost hobbyist PCB fab I read about via Sparkfun. The did take a very long while, but came out beautifully. Also, when the boards finally arrived, I was pleased I had picked a DAC with so few external requirements to solder. The resistors are there to prevent an output buffer short in case I soldered badly, by the way - I don't own a hot air rework setup. 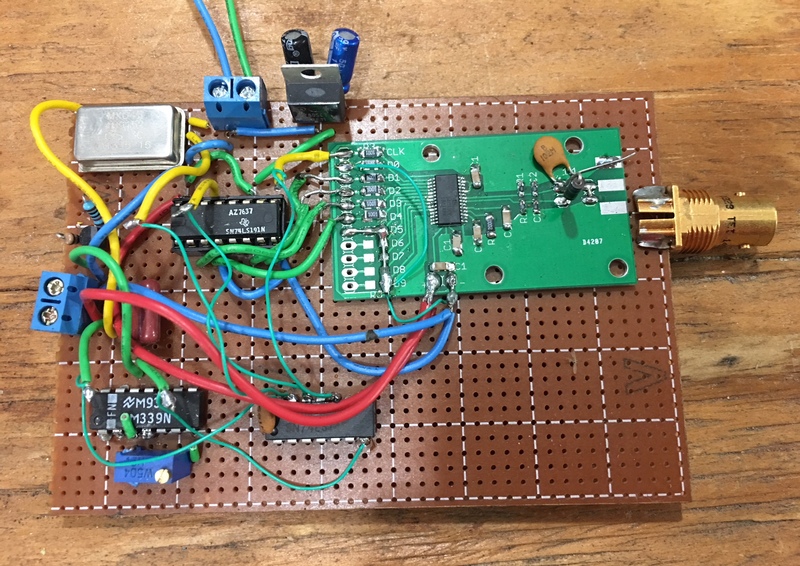 With a bit more hacking, I got the FT245R interface to work such that I send I and Q values via USB, the output value is calculated from an LUT (I originally was doing the math out, but hardware multiply is very slow), and sent to the DAC. In these pics, you can see that I was generating a 500-hz tone over an AM carrier at 9.375 MHz (the 3rd image is the AM-demodulated signal shown on the spectrum analyzer). My code is on Github here. It's by no means robust or feature-rich, but it does work well in my opinion. When I have time, I'd like to see how far I can take this design. Assuming I don't find any unforseen roadblocks, the next step will be to make a board with two DAC900Es for I and Q generation that feed into a GHz-range QAM modulator that takes its carrier from a PLL on the FPGA, which will theoretically give me full TX control over a wide range of freqs. Remember to change the spaces to tabs in the Makefile definitions if you paste it in! Also, one known hassle is that you need to be root or use sudo for anything in the Makefile other than 'make jtagconfig'. When I get around to fixing that, I'll update it here. EDIT: duh, my fault. The problem was that my project directory had previous output owned by root from when I was testing, and the Quartus tools didn't know how to handle that error. Oops. I'm going to Puerto Rico soon, and it just so happens we're staying on a beach facing the continental US. Since we won't have internet nor cell service while there, I thought it'd be fun to send tweets via HF as it would be a good excuse to building some simple analog radios. If I use slow synchronous CW driven and detected by FTDI dev boards and a few lines of C, all I need to do is hack up the radios themselves. In the first pic, I'm again using the tracking generator to sweep only the response of this amplifier and filter (note that I removed the BNC connector I tacked onto the input of the first filter, and connected it directly to the output of the osc buffer). In the second, the whole chain is hooked up end-to-end. It's putting out 27 dBm (1/2W) at ~7.2 MHz, but the last amplifier transistor get warm quickly - looks like I'm going to need to replace that with something beefier.